The world in which Florentine statesman Niccolo Machiavelli lived scarcely resembles our own. City-states have been replaced with nation-states. Empires have collapsed, never to be rebuilt. And modern warfare is waged with weapons and tactics the likes of which he could have never imagined. Yet similarities remain. Although he died nearly 500 years ago today, Machiavelli would be able to navigate our politics as deftly as he navigated his, because the principles that govern them remain much the same. At the time of his death, Machiavelli was well known in northern Italy for his service as a politician and diplomat in Republican Florence from 1498 to 1512 and as a writer of Commedia Erudita, or “learned comedy” plays. He was less well known for two works that now define his legacy: The Prince, first distributed under the title On Principalities in 1513 but not officially published until five years after his death in 1527, and Discourses on Livy, written in 1517 but published posthumously in 1531. Thomas Cromwell, the legal mastermind behind the English Reformation, is said to have admired Machiavelli, and Henry VIII and Holy Roman Emperor Charles V both owned copies of The Prince. But at the time of Machiavelli’s death, few people, if any, recognized in his thought and actions the start of a new, radically modern epoch in politics. Machiavelli’s legacy has since grown to colossal proportions. He is credited with introducing the difference between public and private virtue — between the principles that govern personal morality in friendship, family and business, and the moral logic that guides the politician or statesman. In doing so, as political philosopher Leo Strauss observed, Machiavelli broke from politics as understood by “the Ancients” as the pursuit of a unified public and private “good life” and gave us the notion that politicians can and should operate according to the demands of the state as an entity independent from civil society and its moral imperatives. He understood that in private morality, where a person’s integrity is at stake, the means matter as much, if not more than, the ends. But in public morality, where the power and prosperity of states are at stake, the ends are fundamental even if they do not entirely justify the means. A leader who embraces personal moral imperfection to protect their realm is, in this sense, more virtuous than a ruler who, in their pursuit of moral perfection, fails to consolidate their power, make critical if unsavory alliances and secure, through violence if necessary, that which ensures the survival of their realm. Of course, Machiavelli was not the first to submit that statesmen play by different rules than private individuals. But he was the first to argue persuasively that these rules constitute a morality every bit as legitimate as that of everyday life. The persuasiveness of his case rests not in its philosophical expansiveness — unlike most philosophical discourse, his writing draws heavily on aphorism and anecdote — but in its relation to the world — his world. Machiavelli wrote from life, and his writing has shaped the way generations of political leaders, philosophers and publics understand politics. Just as important, it also shaped the way politicians and statesmen practice politics. 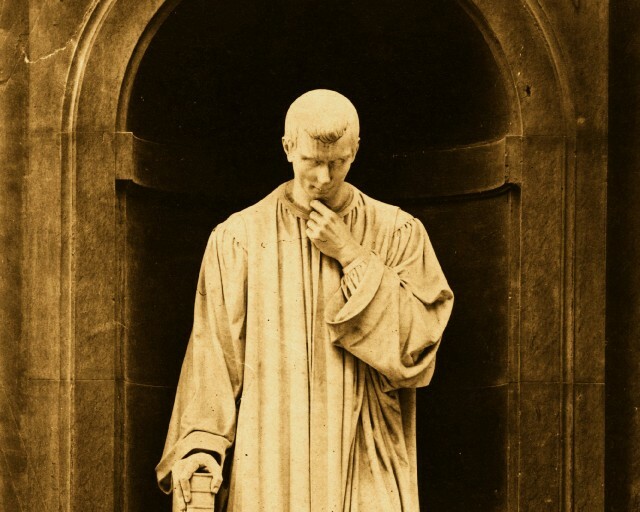 Grasping Machiavelli’s legacy thus requires that we look not only at what he wrote but also the world in which his work was written, for it was in that world that the modern state was given birth. In 1453, two events utterly transformed the world in which Machiavelli himself would soon be born. That year, the armies of the Ottoman Sultan Mehmed II, armed with a 17-foot long, 37,000-pound cannon, burst through the great walls of Constantinople. Once inside, they laid waste to the Byzantine Empire, sounding a death knell for the siege-based warfare that had characterized Medieval Europe and, more broadly, for the feudal social and political orders it supported. Mehmed’s invasion also sent a wave of scholars and artisans, many of them Greek, from the eastern Mediterranean to Italy. By the time of Machiavelli’s birth in 1469, these immigrants were well on their way to planting the seeds for what would become the Italian Renaissance. 1453 also marked the end of the Hundred Years’ War, a series of conflicts that involved more than a dozen belligerents but centered on the relationship between England and France. By clarifying territorial boundaries between the two realms, and thus constituting each as a distinct territorial entity, the Hundred Years’ War laid the basis for what would become French and English national identities — and in turn, for the nation as a model and tool of social, political, economic and military mobilization. The Hundred Years’ War also generated a variety of innovations in military technologies and tactics, such as the longbow, small gunpowder firearms and the wrought-iron cannon, the replacement of heavily armored knights with lightly armored cavalry and infantryman, and the formation of the first standing army since the Roman Empire. The wakes of these two epochal events converged on Machiavelli’s world in 1494, with France’s invasion of the Italian peninsula. In the 1490s, French King Charles VIII replaced the heavy but cheaper wrought-iron cannon of the Hundred Years’ War period with a much lighter and more mobile bronze-cast cannon. With this new artillery, and drawing on the human and other resources that came with French territorial consolidation after the Hundred Years’ War, Charles overwhelmed Italy. Wealthy but diminutive city-states like Florence were no match for Charles’ army. They relied for protection on a technology that his cannon had rendered obsolete — the fortified wall — and on mercenary forces that had little incentive to die in the sorts of decisive field battles that Charles’ artillery and larger armies necessitated. In 1498, Charles died. That same year, Machiavelli was appointed secretary of the Second Chancery of Florence and shortly thereafter was made one of Florence’s top diplomats. In 1499, Charles’ successor, Louis XII, started the Second Italian War, which would last until 1504. Against a backdrop of internecine warfare and ever-shifting alliances, Machiavelli spent the first decade of the 16th century leading diplomatic missions, attempting to institutionalize Florentine relations with other realms and managing the city’s militia, which he helped transform from a largely mercenary-based force into an army staffed increasingly of citizens. He also proposed a number of reforms that later, after the Medicis’ return to power forced him from office in 1512, made their way intoThe Prince. Of these policies, the most famous relate to Machiavelli’s justification of deceit when acting on behalf of the state. But his most important recommendations are those pertaining to the nature, function and organization of the state itself. 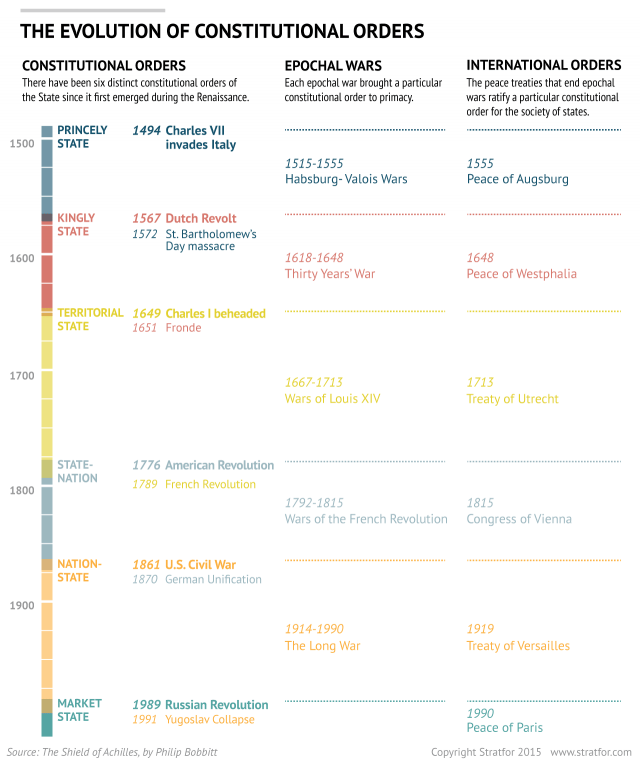 As constitutional scholar Philip Bobbitt describes in The Shield of Achilles: War, Peace, and the Course of History, Machiavelli saw that changes in the strategic environment of his time — the introduction of new kinds of weapons, the raising of larger armies, the retreat of the moral and political authority of the Roman Catholic Church in the face of the Renaissance — demanded changes to the constitutional order and institutional infrastructure of the state. It demanded a shift from loosely organized and weakly institutionalized realms to states capable of harnessing, organizing and deploying resources on a grand scale. And it demanded that the legitimacy of the state be grounded not in dynastic claims or appeals to an increasingly delegitimized Roman Catholic Church but in an ability to maintain stable relations with other states and to protect its society against them. We can see in Machiavelli’s ideas a blueprint for the kinds of centralized states that would dominate Europe in the 17th century: the France of Cardinal Richelieu and Louis XIV; the Prussia of Frederick William; the Sweden of Gustavus Adolphus. We can also see the derivatives of those states in the industrial age: the United Kingdom, Germany, France and the United States under Theodore and Franklin Roosevelt. The ideas that helped to create this world — and the ideas that continue to dictate how its political agents operate — were not the product of Machiavelli’s imagination. They were the product of action and observation in a world of states being remade from within and without by new kinds warfare, diplomacy and social organization. Machiavelli’s writing are as applicable now, almost five centuries after his death, as they were in his life. The modern world abounds in examples of states in the throes of change — change triggered by evolutions in their strategic environment and in the technologies by which they relate to society and to each other, a dynamic Machiavelli was the first to identify explicitly. Japan exemplifies these Machiavellian principles particularly well. The country has responded to China’s economic rise and the United States’ newfound reliance on regional allies by strengthening its military and reforming its domestic institutions to revive its economy. Likewise, China has expanded militarily and economically in part to procure desperately needed resources, even as it attempts to centralize and streamline its political institutions to better manage the difficult times ahead. Europe, Russia, the United States and many others are, in their own way and at their own pace, being constantly and similarly remade by the intersection of external pressures and internal needs. Machiavelli taught the world to think of the state as something distinct and independent from civil society, operating by its own moral logic. In the hands of state-builders like Richelieu and Otto von Bismarck, this idea transformed the way human societies relate to the natural world and to each other. There is virtually no aspect of our world that states do not touch, and thus in which Machiavelli’s impression cannot be seen. And since the state, whichever form it takes, will dominate international politics for the foreseeable future, that impression will remain for generations to come.